The esteemed Criterion Collection has finally given John Schlesinger's groundbreaking classic Midnight Cowboy the due home video credit and consideration it's long deserved. This is a masterful piece of filmmaking featuring two incredible performances by Jon Voight and Dustin Hoffman. As the first (and only) X-rated film to win the Oscar for Best Picture, the film is just as powerful and resonant today as it was 50 years ago as it not only frankly depicts sexuality, but the dark and desperate side of poverty. The Blu-ray features an exceptional A/V presentation along with a stellar collection of bonus features. Turn that dismal 2011 release into a drink coaster - this is the release to have on your shelf. Highly Recommended. "I like the way I look. It makes me feel good. It does. And women like me, god-dammit. Hell, only one thing I've ever been good for is lovin'." John Schlesinger's 1969 film Midnight Cowboy is far and away from being considered anything close to uplifting. It's a hard story to begin with made all the more difficult to watch courtesy of the incredible star-defining performances from leads Jon Voight and Dustin Hoffman. Through its frank depictions of the desperate life of a hustler and the conditions that lifestyle affords, we're treated to a film about two men who never had a friend in the world who come together and forge an unconventional relationship as they try to survive the tough streets of New York City. I was in high school when I first discovered Midnight Cowboy on VHS. While I wouldn't call myself cinematically innocent back then, I have to admit that up to that point I had never seen anything like Midnight Cowboy. It's a haunting film that stays with you. From the gritty visual styling to the hypnotic and disturbing dream sequences and flashbacks to the film's bleak and unrelenting story, a beautiful film about the bonds of friendship emerges. The film never pulls a punch and instead subtly socks you in the jaw through frank depictions of a hustler and his street-wise conman pal. When we're introduced to Jon Voight's colorful Joe Buck, we see him at the height of self-confidence. He's trying on his flashy new cowboy stud clothes and practicing his exit speech to his boss at his dead-end job. He's brash, he's flashy, and he's got a can-do attitude fully believing he can make it as a high-end hustler in New York. After a long bus ride from Texas to New York, Joe quickly learns the hard side of life that he's not special. He's not unique. And there are a dozen other guys just like him on 42nd street peddling the same goods. After befriending the limping smalltime conman "Ratso" Rizzo (Dustin Hoffman), the pair take one last gallant stab at achieving their dreams - Joe Buck becoming a high-class and in-demand hustler with Ratso making enough as his "manager" so he can retire to sunny and warm Florida. As Ratso and Joe tool about town doing anything they can to scrape together just ten dollars to get enough food to survive on while living in squalor, Midnight Cowboy remains optimistically bleak. As you hope deep down inside that whatever con Ratso comes up with next pans out, you know it's not going to get any better for these two. In fact, you're quite certain it's only going to get worse. What keeps you enthralled by their journey is the friendship the two share. Through the flashbacks and nightmares, we know that Voight's Joe hasn't exactly had an easy life. The original novel by author James Leo Herlihy is far more frank and upfront with what happened. Screenwriter Waldo Salt and Schlesinger opted to play Buck's history a little less overtly. If you're paying attention early on, it's pretty clear what happened to him and where this delusion of a life as a successful hustler to any client willing to pay comes from. On the flip side, we have Hoffman's Ratso. What we know about him we learn about by sifting through the acres of malarky he's spread over his story - and it's just as sad and poignant when we discover those nuggets of truth. Perhaps the defining power of Midnight Cowboy deals with the simple fact that people like this exist. If you've spent any time in a big city - or even the shadier sides of small towns - you've seen people just like Joe and Ratso. The people who hunt and scrape for a buck doing anything they have to because that's all they can do. Even if Joe hit it big and Ratso made it down to Florida, you know there's a real likelihood they'd end up back where they started - if not worse off. But they have each other. There's nothing sexual between them, there's only the kinship of their situation that enables them to become friends. By the end of the film, it's easy to say that what they have is the best friendship either of them ever experienced in their lives. They come to rely on one another. It's a hard film. There are a few light moments, but even those bits have a darkness to them, but it's honest and that's what makes it such an endearing film. I don't pull Midnight Cowboy out for a yearly viewing - it's probably a once every few years sort of film for me, but every time I watch it I feel like I'm seeing it for the first time. 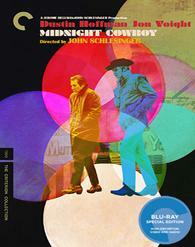 Midnight Cowboy arrives on Blu-ray for the second time - this round courtesy of The Criterion Collection. Pressed onto a Region A BD-50 disc. Housed in a single disc clear Blu-ray case with the spine number 925, the disc loads directly to a static-image main menu with Criterion's traditional menu layout. Also included is a booklet containing a terrific essay by film historian Mark Harris. If there's one thing that is indicative of the Criterion Collection brand, they do their damned best to preset each of their films in the best possible condition. For this 1.85:1 1080p presentation of Midnight Cowboy, they pulled out all of the stops. Featuring a fresh new 4K scan of the original camera negative with segments sourced from a 35mm interpositive for segments where the negative was too heavily damaged - this is easily the best this film has ever looked on home video, and quite possibly better than even its original theatrical run. Now to be fair, Midnight Cowboy was never exactly something someone would call a stunning piece to look at. Heavy grain structure has always been persistent and the film features many stylized dream sequences and flashbacks featuring dull or purposefully blown out colors depending on the scene. I mention this as only a qualifier for those who haven't yet seen this movie so that they know what to expect. Grain is still very present, but it's much more stable and far less intrusive than it appeared in the 2011 release. With that out of the way - If you've ever owned this film on DVD, or even the 2011 Blu-ray release, this film has never looked "amazing." It's not exactly one you want to pull out for friends and family to ogle over when showcasing your A/V setup. But from the start, it's easy to see and be impressed by the restoration work. From the first shots of Voight's Joe Buck staging himself in the mirror to the gritty streets of late 1960s New York, details are impressive leaving nothing behind. The grimy streets, the beads of sweat on Hoffman's grizzled face, the dirt and filth that accumulates on Buck's leather jacket - everything is on display. Colors are well saturated - when and where appropriate - with healthy skin tones and terrific primaries. Some of the dream sequences are particularly striking. Black levels are pitch perfect inky without any haziness that was persistent in previous releases. I've seen this now on four different formats, Laserdisc, DVD, a very worn and spliced to hell and gone 35mm print, and the previous 2011 MGM Blu-ray. Barring a 4K Ultra HD Blu-ray release, this new Blu-ray from Criterion leaves those presentations behind. Midnight Cowboy comes packaged with a pair of audio options, the DTS-HD MA 5.1 mix supplied for the 2011 Blu-ray release as well as the newly restored LPCM 1.0 mono mix sourced from the original 35mm magnetic track. Of the two options offered to cinephiles, it's easy to call the mono mix the clear winner. Not only does it sound more authentic, its overall presentation is stronger and more resonant. The 5.1 mix always felt excessive. Midnight Cowboy never needed a surround presence to be effective - if anything adding the extra space around the channels pulled from the visceral qualities of the film - in particular, a few key flashback sequences that explain Joe Buck's background. Free of any hiss, pops, cracks or other age-related anomalies, this mono mix offers up a clean and clear presentation that allows you to easily hear the dialog, John Barry's terrific score, the signature tunes of the time, but also beefs up the punch of several key scenes. The big artists' party is a cacophony of dialog, music, and sound effects that only gets louder and louder as the scene intensifies. The Criterion Collection has assembled a terrific assortment of new bonus features as well as some classic features that haven't seen the light of day since the Laserdisc era. There is a lot of great material here to pick through and fans of the film will appreciate the opportunity to dig into some of the older featurettes and documentaries. Audio Commentary featuring John Schlesinger and Jerome Hellman. This is the original commentary track recorded in 1991 for the Laserdisc release, it's a terrific listen as Schlesinger offers up a ton of detail and information about making the film. Michael Childers Interview (HD 13:59) This a great interview with Childers who was Schlesinger's personal assistant and life partner - he offers up a lot of personal anecdotes about the making of the film and he took several candid photos during the making of the film that is showcased during this interview. Adam Holender Interview (HD 25:13) Cinematographer Adam Holder provides a lot of insight and information about the working of the film. The Crowd Around The Cowboy (HD 8:51) This is a quick but still an interesting behind the scenes look at the making of the film. After Midnight: Reflecting On A Classic 35 Years Later (SD 29:59) Sourced from the 2004 DVD, this is a great documentary featuring a number of amazing cast an crew interviews. Controversy and Acclaim (SD 10:10) Also sourced from the 2004 DVD, this is a close look at the film's reception and the difficult rating process as the filmmakers never intended to make a film for children. John Schlesinger Interview (SD 15:28) This is a fantastic interview with the late filmmaker as he discussed his attraction to various films and drove him to want to tell these stories. John Schlesinger BAFTA Tribute (SD 33:09) This is a nice tribute piece for Schlesinger with speeches by various people who knew and worked with him. Waldo Salt: A Screenwriter's Journey (SD 57:18) This is a great documentary about Salt and his career path that began with The Shopworn Angel in 1938 and winning the Oscar for Midnight Cowboy. Midnight Cowboy is far from being an easy film to watch. It's not one that I pull out alto often - but it's an essential piece of filmmaking that any and every film fan needs to see if only once. A true classic from it's straightforward direction to the impeccable screenplay to the incredible performances from its two lead actors. There is a dark and sad beauty to the film that is impossible not to appreciate. The Criterion Collection adds Midnight Cowboy to their ranks in terrific order with a beautiful new image restoration and a fully restored mono audio track. With hours worth of bonus feature content, this Blu-ray is an essential release for fans. If you've never seen it, now is the time to give it a spin. Highly Recommended.